Fourteen years ago, 16 whales and dolphins washed up on the shores of the Bahamas after the U.S. Navy conducted a series of sonar experiments in the area. Seven of them died, and a government report later found that the Navy's nearby sonar testing was a contributing factor in the tragedy. Now the incident is a crucial piece of evidence in two lawsuits recently filed against the Navy and other federal agencies by conservation groups. At issue is the Navy's “war games" that are currently taking place through 2018 off the coasts of California and Hawaii. By the Navy's admission, the activities will result in the deaths of 155 marine creatures in the area, not to mention "more than 2,000 permanent injuries, and millions of instances of temporary hearing loss and significant disruptions of vital behaviors." Last week, a motion was filed in both lawsuits by the Conservation Council for Hawaii, a Hawaiian environmental conservation group, asking the court to declare the training illegal for violating several federal laws meant to protect endangered animals. Sonar testing and underwater detonations are both planned on an unprecedented scale for the games. Using numbers provided by the federal government, the National Resources Defense Council (NRDC), an environmental action group, estimates that the detonations and increased use of sonar represents an "1100 percent increase" in harm the Navy is estimated to have caused by the previous five years of training in the area. The ecological impact that these explosions could cause to the natural environment is an issue that the courts have taken up times in the past. In 2008, the Supreme Court decided that "[e]ven if plaintiffs have demonstrated a likelihood of irreparable injury, such injury is outweighed by the public interest and the Navy’s interest in effective, realistic training of its sailors." But activists say this time is different. “The case we have today is different because the scale of harm is so much bigger, and the science on the impact of sonar has advanced so much since then," Zak Smith, staff attorney for the NRDC, told Fusion. "And ironically a lot of that science has come from the Navy themselves." During the 2000 incident, mid-frequency sonar was used by five ships for a total of 80 hours. Through 2018, the Navy will be testing mid-frequency sonar in the Pacific for an estimated 10,043 hours annually, along with an estimated 7,148 hours of high-frequency sonar. And during a single incident in 2011, three dolphins were killed by a ten pound underwater bomb detonated by the Navy off the coast of San Diego. The Navy has been approved to detonate up to 44,685 pounds of explosives every year over the same time period. For its part, the Navy says that it "learned a great deal through its investigation of the Bahamas stranding," and has since taken "great strides" to avoid similar events. The document that granted the Navy permission to use the waters for the war games found that "the unintentional harassment of marine animals," including the death of animals protected by federal laws, should be considered "incidental to Navy activities" in accordance with other federal laws. 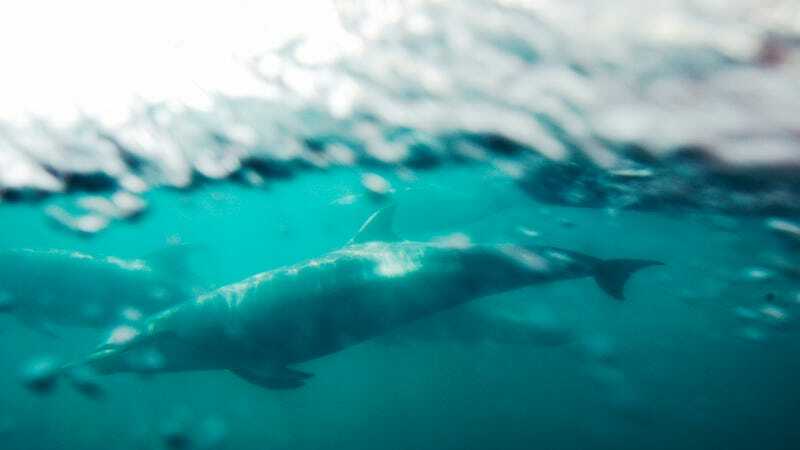 "The numbers of marine mammal injuries and mortalities estimated in our planning documents, which are not annual numbers but actually cover a five-year period, represent worst case scenarios," said Navy spokesperson Kenneth Hess. "Despite decades of the Navy conducting very similar activities in these same areas, there is no evidence of these types of impacts." Smith of NDRC is not buying it. "The Navy is supposed to give an honest assessment of the expected impact, not play the game of worst case scenario," he said. "If they don't give the public honest numbers that they can stand behind, how is that doing anybody any good?"